This Single Malt from the heart of Speyside is easy accessible, not very complex and comes without an age statement. The nose is characterized by toffee/caramel notes, citrus fruits and engaging hints of baked plums. However, the occasional spiritiness and rather intense brown sugar sweetness might be off-putting to some. 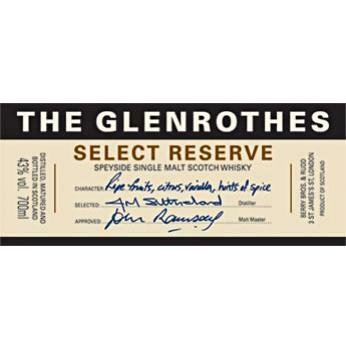 On the palate, Glenrothes Select Reserve is mildly spicy and sweet with honey, vanilla cream and ripe fruits. The finish is short, clean and slightly dry. 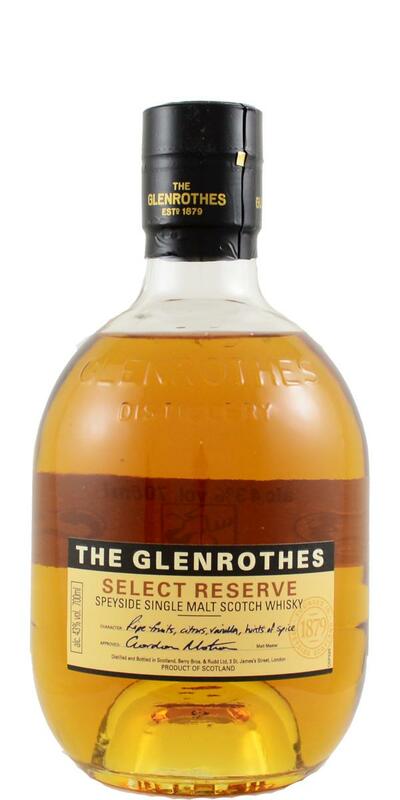 An average everyday dram that is comparable to better Blended Scotches. Simple and nimble unpretentious mute with taste and smell of lemon in sweet tea, normal for its price. Green grass, flower-honey tones, the smell of tea with lemon, in the background - an old dusty tree, beeswax, not spirtuzen. Soft, begins with a slight note of bitterness and dust, then - pepper and a transition to a bitter sweet dominant. Continuation of taste - citrus bitter-sweet theme against a damped wave of pepper / ginger, medium duration. Honestly, this tastes more like a simple blended whisky. It's okay, I guess. But I feel you could do so much better, even at this modest price point. Very musty with hints of grist and sugared cereals. There's a layer of sourness here that is, I don't want to say off-putting, but certainly far from enticing. Luckily it does disappear (although not completely) after a while, making room sultanas and oranges. Sweet and spicy, with a fair amount of oak. The sweetness is provided in the form of vanilla and dried fruits, then there's some cloves and black pepper to add a spiciness. Short to medium, with a lingering oakiness. Well. It's all ok - and he does not tear me off the stool. No complexity, no fireworks. A pleasant smell on the nose, gentle on the palate with a surprisingly long finish - it lingers (in a good way - not like a house guest who has outstayed their welcome). First, a slightly musty note comes to mind. With some time in the glass .... light coconut, with a little vanilla. In the background something gummy. Removes sweet white wine. It is now clearly malty. Slightly sharp start. Sour citrus note, followed by a pleasantly fruity, sweet note. Bitter almond. And a somewhat musty taste. Medium long, slightly sour bitter. Then a little oily.